Have you ever traveled off of the beaten path and decided to create a new one? What happened? While in Nassau, Bahamas, Aaron wanted to go beyond the touristy places and went to a bat cave. Within a few steps he was in this natural cathedral of bats (not touristy, but definitely unique!). By going off the beaten path, he had a unique experience. Near the end of the event he attended in the Bahamas Aaron met a man that thought outside of the box in the business world and was tremendously successful in large corporations because of it. He had figured out a way to not go with the norm, so Aaron asked him what his key to success was. Live within your means and don’t get into debt. If you’re standing in line, you’re probably in the wrong place. In Portland there are some unique points that require outside of the box thinking that help preserve a natural habitat between Wallace Park and Chapman Elementary School. 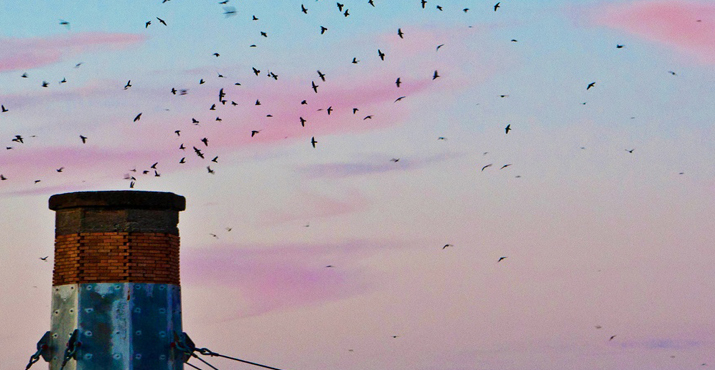 The school has a gigantic smokestack that has been preserved as a nesting place for swifts, providing a unique scene for anyone watching.